The HP TouchSmart 610 is a reclining touchscreen computer just introduced by Hewlett-Packard. The computer has a 23-inch diagonal high-definition display that reclines 60 degrees and tilts forward up to five degrees. The TouchSmart 610 is a consumer device; HP will make the TouchSmart 9300 Business PC available in May. It is a wide angle display with a light-emitting-diode (LED) backlit liquid-crystal display screen. It comes with touch-optimized applications including Hulu, Twitter, Rhapsody, and Twitter. And it has HP’s own RecipeBox and webcam apps. The TouchSmart 610 model includes its high-quality audio Beats Audio system and it also has a free copy of Ubisoft’s real-time strategy game, R.U.S.E. The TouchSmart 610 also has HP LinkUp, a new application that allows users to wirelessly link the screen of a notebook computer to the TouchSmart using a home network. 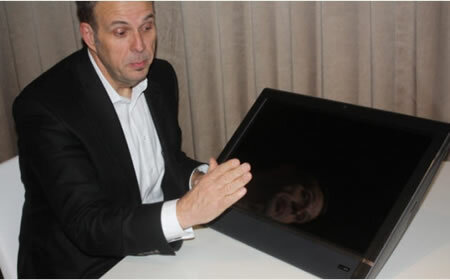 The notebook’s screen appears on the TouchSmart’s display; then you can tap the display with your finger to control files and commands on the notebook computer. It effectively turns a notebook display into a touchscreen. 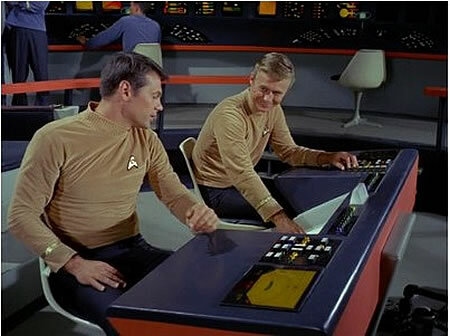 Star Trek fans recall the flat control surfaces used even in the original series; these displays and control surfaces became more elaborate in succeeding generations.